The first asks whether bonds should be issued for $57 million to be repaid over 10 years to improve the jail. The measure stresses that the bonds only would be issued if voters also approve an increase to the sales tax. The second measure asks if the county should raise the sales tax by a half-cent for 10 years – to 6.5 percent – to fund both property tax relief and the jail expansion. 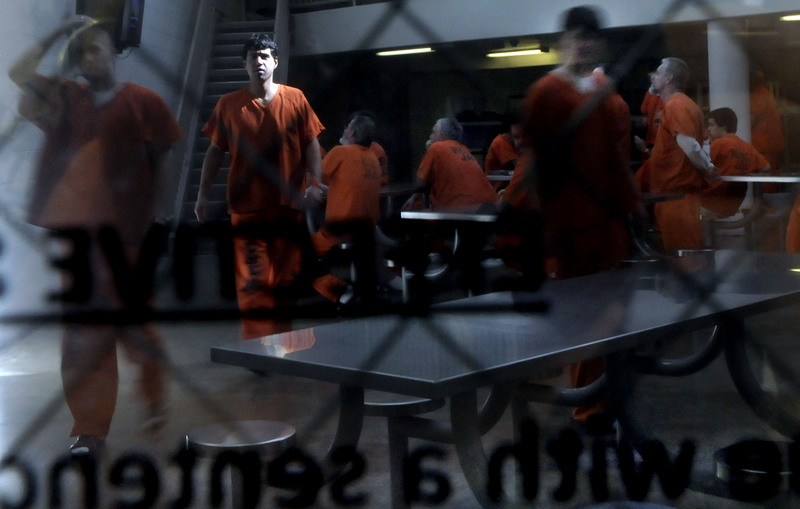 In the Kootenai County Jail on Monday, two inmates in one 50-person dormitory wore green jumpsuits in a sea of orange. The green indicated lower-risk inmates mixed in with many more who pose a greater risk. That’s not desirable, but with limited space, jail personnel have to decide whom to put where, said sheriff’s Capt. Travis Chaney, the jail commander. The county has been juggling space problems for years as its 325-person jail is regularly pushed to capacity. On Monday morning, 311 inmates filled its chambers, but that doesn’t mean 14 beds were available. An additional 11 inmates were being housed at facilities outside the county. Jail personnel must separate inmates based on factors including gender, gang affiliation and risk level. “You want 5 to 7 percent of your beds available at all times,” Chaney said. A pair of measures headed for the November ballot will mark the county’s third attempt in four years to address the problem. And November will be the last opportunity the county has to expand its jail using a local-option sales tax, which expires at the end of the year. Measures to expand the jail failed in 2005 and last year. In November 2008, voters loudly said no to a $147 million measure that would have expanded the jail and updated public safety facilities. The measures required a supermajority – two-thirds of the vote – to pass, but failed with almost that many people opposing them. Kootenai County Commissioner Todd Tondee said county leaders listened to the voters and have proposed a measure to expand only the jail, and more cheaply. Whereas the jail expansion made up $88 million of the last ballot measure, this time voters will see a proposal for a net gain of 457 beds coming in at around $57 million. Cost savings come both from using precast cells shipped to the site instead of concrete poured in place, and a construction climate in which costs have declined, Tondee said. The expansion would be built on county land beside the jail and would include many more cells that can be locked down individually, providing more flexibility in handling a changing inmate population, Chaney said. As the population has grown, increasing numbers of jail inmates pose higher risk, said Lt. Neal Robertson. A one-day inventory in May 2008 showed 412 people in jail, with 154 classified as an escape risk or having assaultive behavior, with only 55 beds available, he said. The proposed design also would expand jail services sufficient to meet the needs of 1,300 inmates, the expected future site capacity. The kitchen, evidence rooms, laundry, infirmary and storage rooms would be expanded to meet county needs for at least 10 years, Tondee said. By “rent,” Tondee means paying for inmate space at other jails when the county is full. The county estimates the cost of housing and transporting the inmates at about $52 million over a 10-year period, he said. County voters will see two measures on the ballot. The first asks whether bonds should be issued for $57 million to be repaid over 10 years to improve the jail. The measure stresses that the bonds only would be issued if voters also approve an increase to the sales tax. The second measure asks if the county should raise the sales tax by a half-cent for 10 years – to 6.5 percent – to fund both property tax relief and the jail expansion. County Finance Director David McDowell said preliminary projections show that about $136 million would be raised by such an increase over a 10-year period, enough to provide $68 million for construction, plus interest, and $68 million for property tax relief.